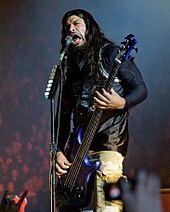 The bandname came from Ulrich's friend Ron Quintana, who was brainstorming names for a fanzine and was considering MetalMania or Metallica. Dave Mustaine replied to an advertisement for a lead guitarist; Ulrich and Hetfield recruited him after seeing his expensive guitar equipment. In early 1982, Metallica recorded its first original song, "Hit the Lights", for the Metal Massacre I compilation. 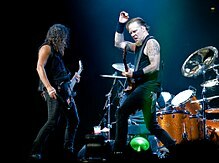 Hetfield played bass, rhythm guitar and sang while Lloyd Grant was credited with a guitar solo and Lars Ulrich played drums. Metal Massacre I was released on June 14, 1982; early pressings listed the band incorrectly as "Mettallica", angering the band. The song generated word of mouth and the band played its first live performance on March 14, 1982, at Radio City in Anaheim, California, with newly recruited bassist Ron McGovney. Their first live success came early; they were chosen to open for British heavy metal band Saxon at one gig of their 1982 US tour. 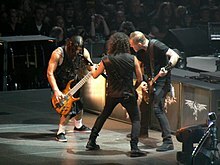 This was Metallica's second gig. Metallica recorded its first demo, Power Metal, whose name was inspired by Quintana's early business cards in early 1982. Clarence Collins, Anthony Gourdine, Tracy Lord, Glouster "Nat" Rogers, Sammy Strain, Ernest Wright Jr.